We are excited to share our very first guest post. 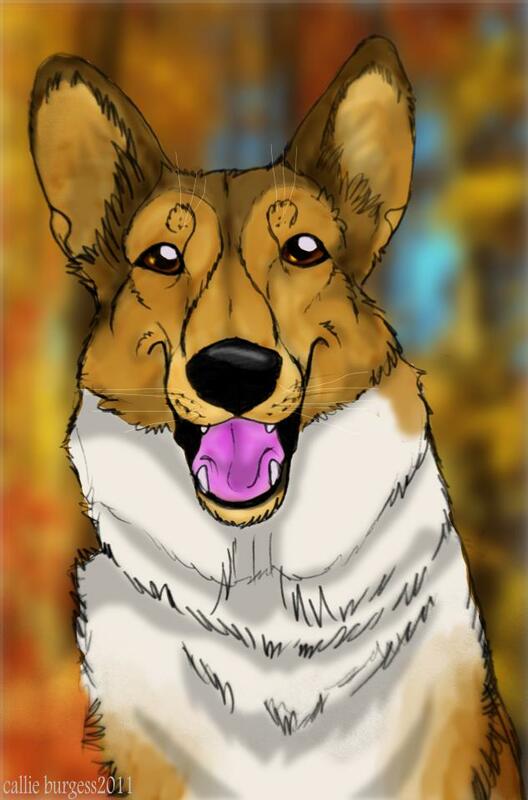 We wanted to share some of the amazing things different individuals are doing with their collies. 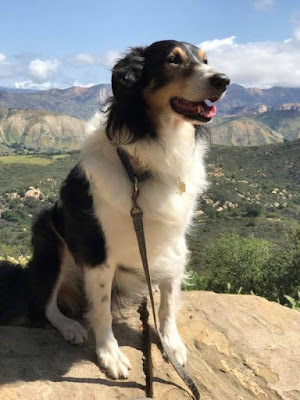 These posts will hopefully show the versatility of the collie breed. In the upcoming weeks, we will be sharing just a few of the sports and activities in which our wonderful collie breed participates. Daphne Lewis is our first guest, and she has trained her Collie, Tug, to pull her sulky. What is a sulky? Read more to find out! Hello! Greetings from Daphne Lewis, the Dog Sulky Lady at the bamboo farm in Hawkinsville, Georgia. Today I hitched my smooth collie Tug, along with my other dogs, to my sulky made of bamboo. First we trotted here and there on the bamboo farm. We practiced right and left hand turns as we navigated the farm. I find that Tug, with his long nose and long legs, is less bothered by the heat than the other dogs: labradoodle, shepherd mix, and two bulldogs. After about a half a mile we crossed my road and cruised beside the fence of the neighbor’s cow pasture. My collie strode into lead even before we reached the fence. He was excited by the cows. He sees that we will be going beside the pasture. He used to charge the fence which was terrifying. Now he just speeds up and cruises along at around 7 mph. The bamboo sulky allows me to exercise all my dogs at once. I ride and the dogs trot. Sometimes they gallop, but mostly it is a trot at their cruise speed. We do practice “WALK!” sometimes, but they don’t like to walk when they can trot. It would be difficult for me to exercise them enough without the sulky. 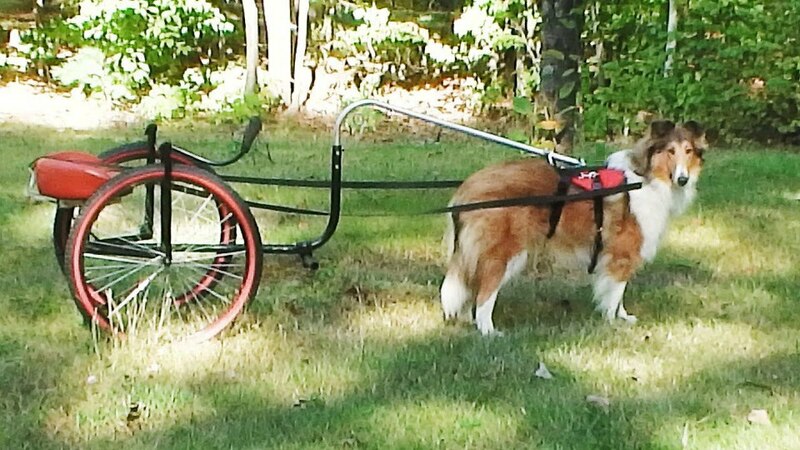 Dogs trained to pull a sulky can pull wagons and carts as well. One of their jobs is to haul tree chips. They learn to wait quietly while I load the dump wagon, and while I spread the dump chips. Amazingly, I can leave tug and the other dogs in a down-stay, while hitched to a wagon or sulky, while I return to the house for something I forgot. When we finish our work, I kneel in the wagon and the dogs trot back to the garage where the wagon stays. Last weekend, Tug and my other dogs spread a lot of chips to mulch around the bamboo. It is hot here in middle Georgia. I bought CoolCoats from RuffWear. They keep the dogs cool. You wet the coats down and evaporation keeps them cool. (Which is important when your dogs are working) The coats reflect the sun light. I keep my dogs groomed short in summer which makes the coats even more effective. Sometimes, Tug and my other dogs trot on sidewalks in my town. It is fun saying hello to people and the dogs do a great job of navigating street corners, traffic lights, and cross walks. Sometimes we go the drive-up window at McDonald’s for sausage. What a treat for the dogs that sausage is. I sell dog sulkies at www.ChaloSulky.com. On that site is a page called “How to Train”. If you are interested in the sport of dog driving, take a look at my site and Facebook page for Chalo Sulky. I have many videos on YouTube under Daphne Lewis. Thank you Daphne, it sure looks like fun, and Also a great way to exercise your dogs! Please click on the link above to learn more about Sulky driving, and the benefits for your dogs. I'm sure most people would picture a husky pulling the sulky, but as you can see,collies excel at this sport too! 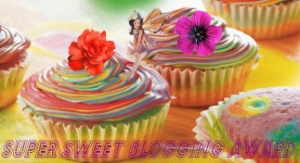 What a fabulous guest post! That video is terrific, I've never heard of a Sulky but what a great way to exercise your dog. I have a Husky and exercising her enough is a challenge. I wish we had some open space to do something like this, but it's so crowded here on Long Island, NY we couldn't do it. 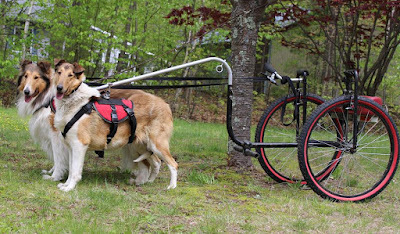 Thanks for sharing, I love to see working dogs like Collies & Huskies actually working! How interesting! I've known people who trained their dogs to pull, but they were giant breeds. Very cool that this is a good way to exercise other large dogs as well. Wow, I had no idea that they could pull a sulky. My daughter's old Newfie mix would pull a wagon filled with kiddos. What a great way to exercise them and utilize their strength with a specific job. Dogs are much happier when they are working. What a fine post. Thank you! I didn't know collies could do this! What a great way to exercise them! We hope you didn't give our Mom any ideas. We don't want to drag things around for her.